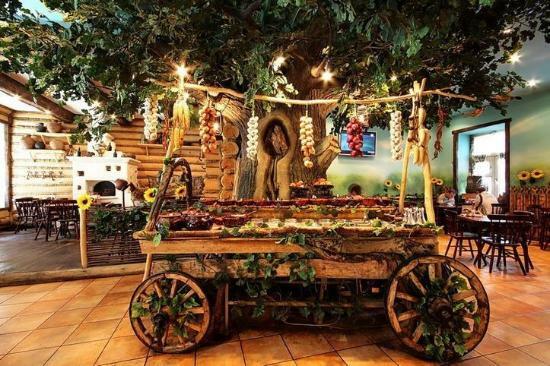 In Moscow you can find a variety of restaurants of typical Russian cuisine, from Russian fast food and buffets (such as Teremok, Kroshka Kartoshka, Mu Mu, or Yolki Palki) to Russian haute cuisine end restaurants (such as Cafe Pushkin, Mari Vanna or Farenheit). I would add the cuisine of former Soviet republics such as the Georgian, Uzbek and Ukrainian gastronomy, just to name a few. In Moscow you can find a variety of Russian cuisine restaurants, either fast food or buffets, as excellent restaurants serving local cuisine. Also, you can find very good international cuisine restaurants: Asian, Italian, Mediterranean, etc. In this article I want to focus in Russian cuisine restaurants (both fast food and the more elaborate cuisine restaurants) but also in the restaurants of the countries of the former Soviet republics (Georgian, Ukrainian and Uzbek cuisine, for example), that are widely spread. Prices. The prices indicated in the article are approximate and depend on many factors, but in a fast food restaurant is possible to eat a menu for between 300 and 800 rubles, in a buffet the price can range between 800 and 1500 rubles, while in high-end cuisine, the restaurant menu prices are usually upwards from 1500 rubles. Schedules. In Russia, food is served from noon to 4 pm, while dinner is usually served between 6 pm and 11 pm, though it is rather from 8pm when restaurants start to fill up. Tips. The normal thing is to leave a tip that can vary between 5 and 10%, if the service deserves it. In Moscow you can find many McDonalds, Burger King, KFC and Subway, but for tourists visiting Russia it is much more interesting to test the Russian fast food restaurants offering typical local food (blini, grechka, pelmeni, borsch, sirniki, etc.). They are a good alternative if you are looking for something affordable, if you have little time or if you go with children, since the meals are adapted to the tastes of the smaller ones. The two major chains are Teremok Russian fast food and Kroshka Kartoshka. The first, based on the world of blinis (crepes), and the second in the world of the potato. You can find them in central locations and in the city’s shopping centers, sometimes in the form of restaurant and the other in street kiosks. 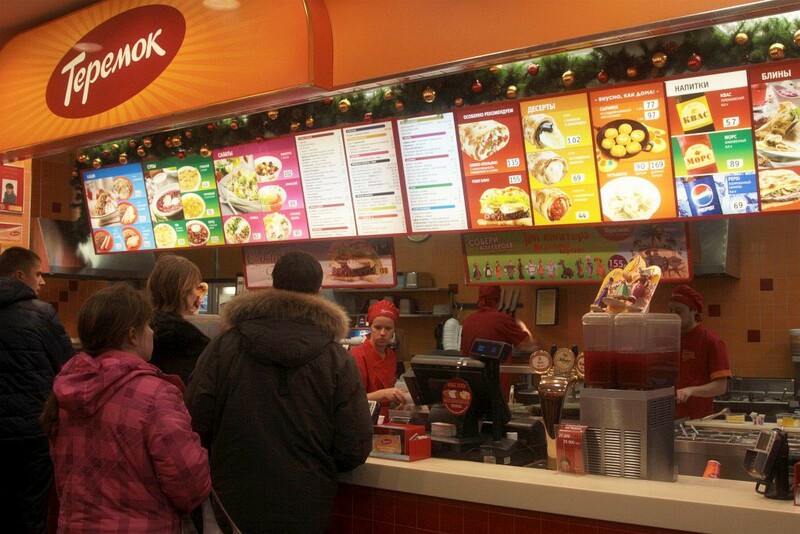 Teremok (“Теремок”) is one of the most widespread and known Russian fast food chains. The menu is based on blinis (crepes that are stuffed with multiple ways, including caviar), but you can also try the pelmeni, Russian salad, etc. You can also try traditional Russian beverages such as kvass (a drink made of bread). 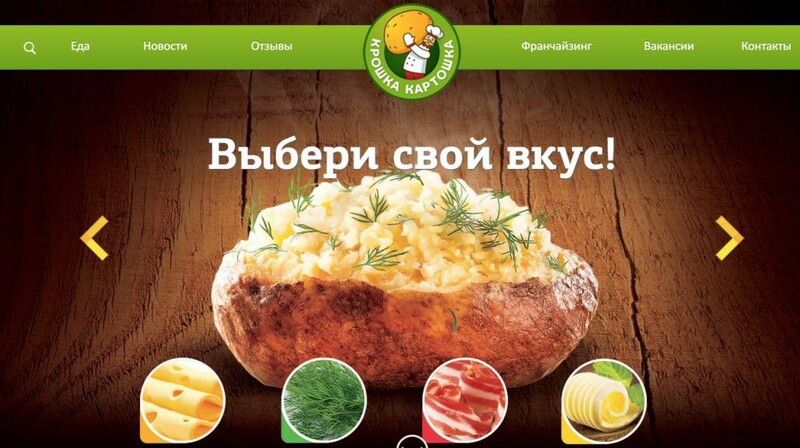 The other Russian most widespread fast food chain is Kroshka Kartoshka (“Крошка Картошка”). Its name would mean something like “small potatoes” and all their food revolves around the potato, the second most important product in Russia (after the bread) and consumed in all possible ways: in soups, salad, boiled, mashed, fried, etc. Despite its name, they serve large potatoes in all possible ways (baked and wrapped in foil with butter or cheese, herbs, meat or mushrooms). But they also offer other Russian food dishes like pelmeni, vareniki (dumplings with cheese) or potato salad. They opened their first store in 1998 and it already has more than 200 locales not only in Moscow and St. Petersburg, but also in other major Russian and Ukrainian cities. 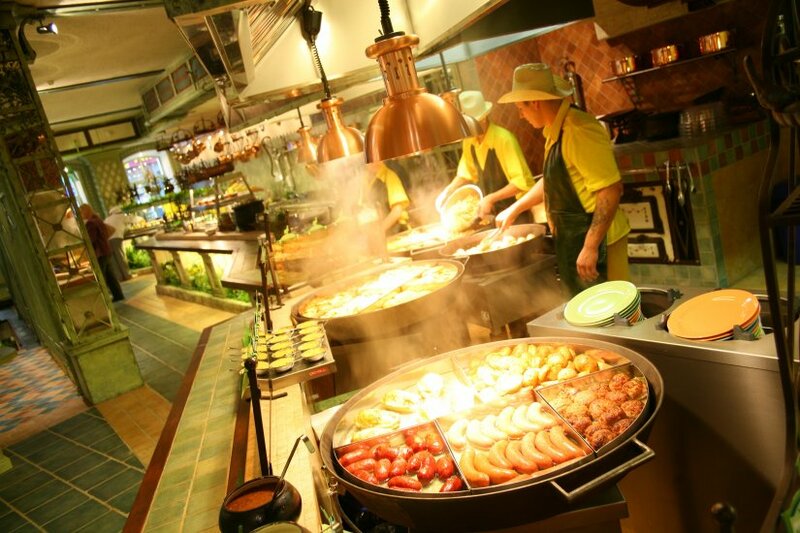 In Moscow you can also find chains of self-service or buffet style restaurants. The most common system is to take a tray and choose the dishes you want (you pay what you consume), though there are buffet restaurants where you pay whatever you consume by a fixed amount. It is a more elaborate food than what you can find in fast food chains mentioned above. Prices also tend to be fairly inexpensive. The good thing about these chain restaurants is that the dishes are in sight and you simply have to point your finger at anything that looks good or that catches your attention. Some of these chains also display their signs in English, so it is not mandatory to understand Russian to know what you are eating. The major chains are Mu Mu, Grabli and Yolki Palki, to which I would add the self-service restaurant Stolovaya 57 in GUM Galleries, located in Red Square. Mu Mu (My-My) is the most known, but it’s probably the most basic and economical. 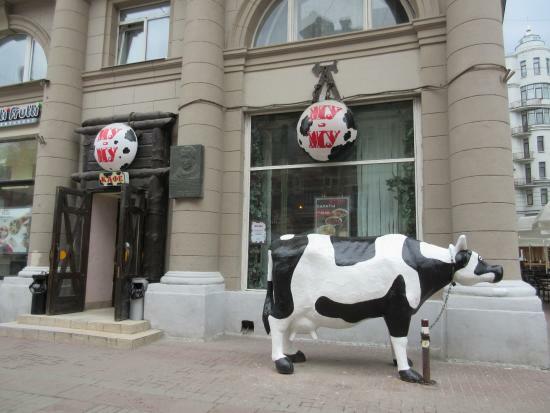 You can find these buffets through the central streets of the city and they’re easily identified by the exhibited cow at the door of each establishment. They offer all kinds of Russian cuisine dishes. 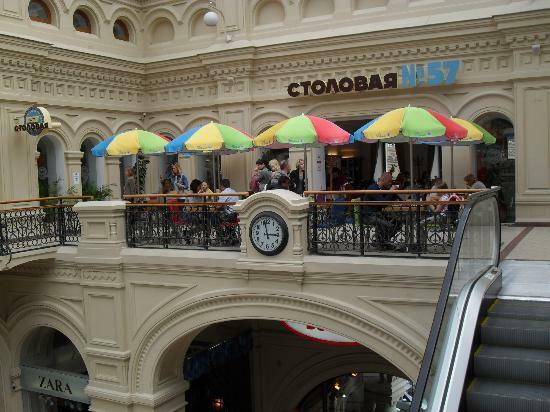 If you’re in Red Square and you’re looking for a cheap and quick place to eat, on the third floor of Gum Galleries you will find Stolovaya 57 self-service, where you can find a variety of dishes at fairly inexpensive prices. Perhaps the employees don’t know a word of English but the service is usually quick and inexpensive. On the third floor you will find also another similar self-services. The quality of food in Grabli is better than what you can find in Mu Mu. The atmosphere is more modern and spacious, and with a variety of dishes. 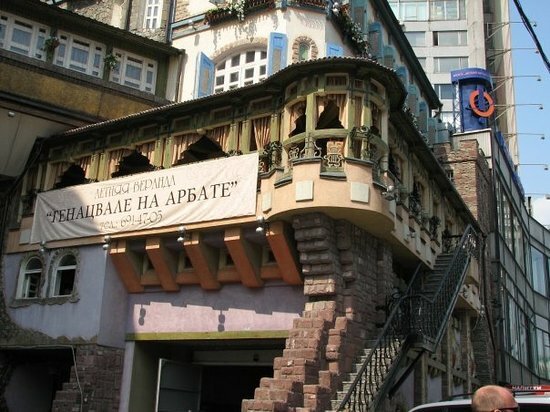 Another known restaurant chain is Yolki Palki, decorated as traditional taverns. It is an excellent choice to try typical good Russian food at very reasonable prices. Aside from fast food outlets and self-served restaurants, in Moscow you can find a great variety of gourmet restaurants for all tastes and budgets, where the order is a la carte or you choose from a menu. 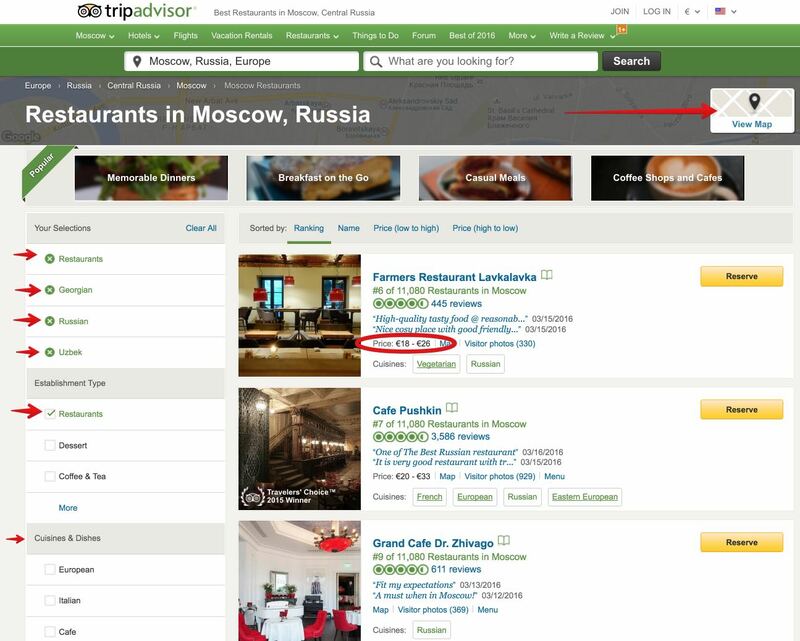 Many websites publish lists of “the best restaurants in Moscow” but this is always very subjective and variable, as you always see the same restaurants. 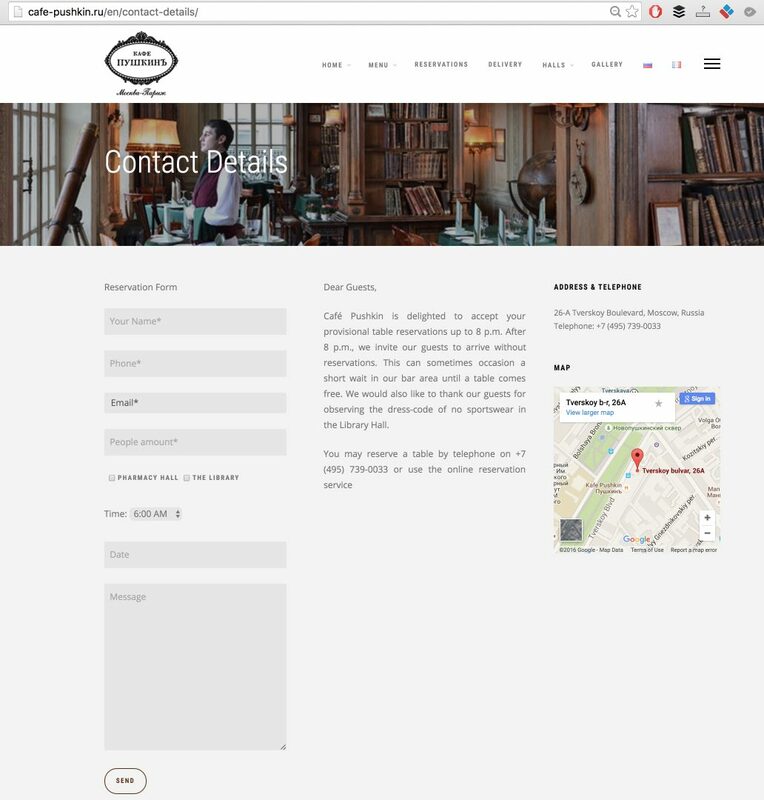 Moreover, it is impossible to try all the restaurants to make a list with these features. You can select the type of cuisine: Russian, Georgian, Uzbek, Ukrainian, etc. You can see the approximate price of the menu to have a reference of what it will cost you (though sometimes the prices are not very accurate). You can see the restaurants on a map to find those near your location. Café Pushkin: probably the most famous restaurant in Moscow and that you’ll see on all lists of restaurants in Moscow (see photo at the beginning of this article). Grand Café Dr. Zhivago: another known and famous restaurant. 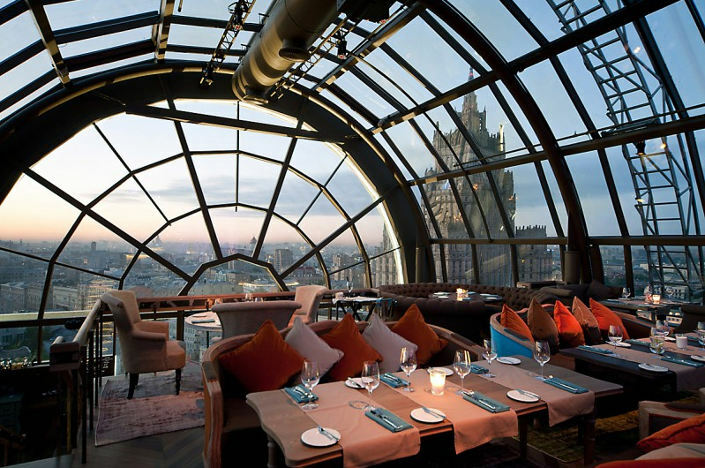 White Rabbit: a restaurant that appears on some lists of the top 50 restaurants in the world and has spectacular panoramic views of Moscow (see photo below). Mari Vanna: excellent restaurant, decorated like an apartment, which also has branches in St. Petersburg, London, New York and Washington. Farmers Restaurant Lavkalavka: vegetarian Russian cuisine. Chestnaya Kuchnya: excellent Russian Haute cuisine restaurant. Expedition: Siberian food inside a room decorated with real helicopter. Lepim i Varim: Modern restaurant opened in late 2015 with great reviews. 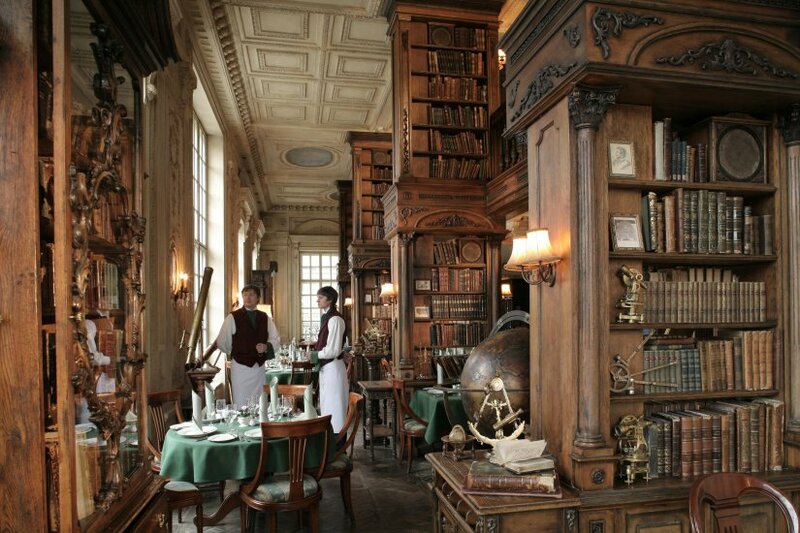 Bolshoi Restaurant: one of the best restaurants in Moscow just behind the theater. Restaurant Metropol Hall: the restaurant of the centric Metropol hotel. Anatoly Komm for Raff House: restaurant run by one of Russia’s most internationally renowned chefs. Genatzvale: in Arbat area (see photo below). Khachapuri: a Georgian food chain which has several restaurants in the center of Moscow. 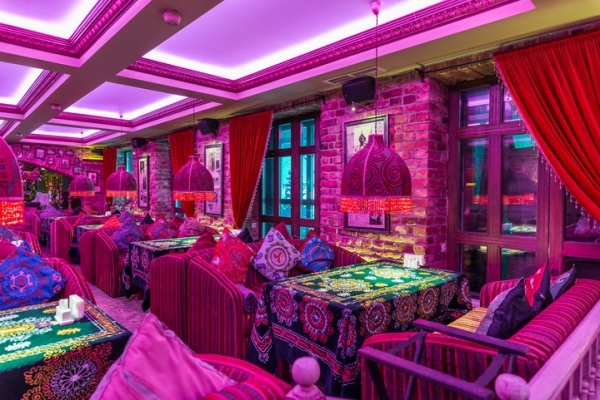 As for Uzbekistan cuisine, you can find the colorful restaurants of Uryuk chain (pictured below), whereas in regards to the Ukrainian cuisine, it’s worth mentioning the good valuation that the Taras Bulba chain receives with 16 establishments in Moscow (they also have 1 restaurant in Kiev and one in New York). In some restaurants, especially the most famous, you need to book in advance. If you are staying in a hotel it is easiest to ask the receptionist who will make the reservations in your name, as in restaurants they do not always speak English. 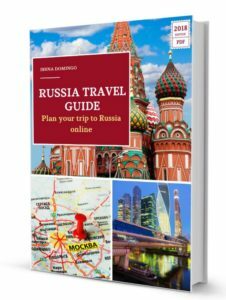 I hope this article helps you choose a good restaurant in Moscow. You can help me too by sharing this article on your social networks. Thank you very much.